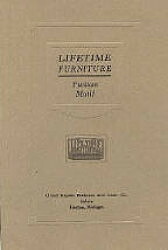 This is a catalog of �Lifetime� furniture, which was manufactured by the Grand Rapids Bookcase and Chair Company of Hastings, Michigan. 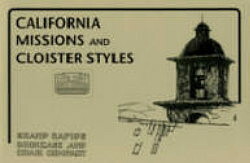 The �Cloister Styles� shown here were created by the company in 1911. This catalog shows the quintessential heavy, massive, masculine style of mission furniture that was so popular a century ago. Even though some of the forms are similar to designs of Gustav Stickley and L. & J.G. Stickley, there are a number of original designs that distinguish this company as one of the major actors in the American Arts and Crafts Movement. Softcover 112 pp, see below to order. This book is the essential companion to the Life-Time Furniture reprint of the 1911 catalog. 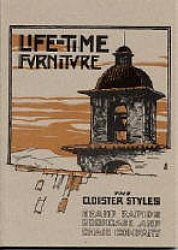 Lifetime Furniture, Puritan Motif, 1918 Catalog features Lifetime Furniture exclusively in the Puritan motif, or �refined mission style�, in the words of the company�s ad copy writers. This light, elegant Arts and Crafts furniture, characterized by long graceful corbels and arched stretchers, was introduced in April 1917 and was popular with the public for years after Gustav Stickley and most other leading Arts and Crafts furniture manufacturers went out of business or moved on to historical period motifs. This book reprints the complete contents of the 1918 catalog together with the original November 1918 price list. The catalog features 75 different forms of Puritan-style mission furniture. The book includes a scholarly Introduction illustrated with period photographs. Softcover 48 pp, see below to order. This 32-page book is a catalogue that was originally printed by the Grand Rapids Bookcase and Chair Company ("Lifetime") expressly for the Lyon-McKinney-Smith Co. of Los Angeles, California. The book is interesting not only for the several forms of Lifetime furniture that do not appear in other catalogue reprints but also because the right-hand page of successive page spreads feature contemporary photographs of thirteen California missions with a brief history of each mission excerpted from Jesse S. Hildrup's The Missions of California and the Old Southwest. Softcover, 32 pp, see below to order.